Firewall stars Indiana Jones, Chloe from 24, and the T-1000. Now that we’ve gotten the most favorable details of this movie out of the way, it’s pretty much all downhill from here. Indy plays Jack Stanfield, loyal family man and IT security manager of a bank in Seattle. His old and tired character is called into action when his family is kidnapped to coerce him into assisting a villian group of bandits rob the bank. This unfortunately has none of the intensity of Keanu Reeves helping Swayze and surfer pals rob a bank at gun point in Point Break, but most of the excitement of watching Peter Gibbons in Office Space eat Cheetos at his desk and play Tetris. The bank is robbed electronically using a gadget built by Harrison Ford out of an iPod. All of the characters in this film are disposable except for the T-1000 who solely manages to capture the viewers interest for brief segments. He certainly still has the look that says everything (or nothing), as he did more than 10 years ago in his most memorable role. If you’ve ever seen 24, Chloe plays Fords secretary in this film – she’s Chloe here also, nothing more and nothing less. I have to think that many people interested in cyber-culture cinema (Sneakers, Hackers, War Games, The Net) would seek this one out looking for it to possess the same merits, but it doesn’t at all. Matter of fact, the title of the film is completely inappropriate. 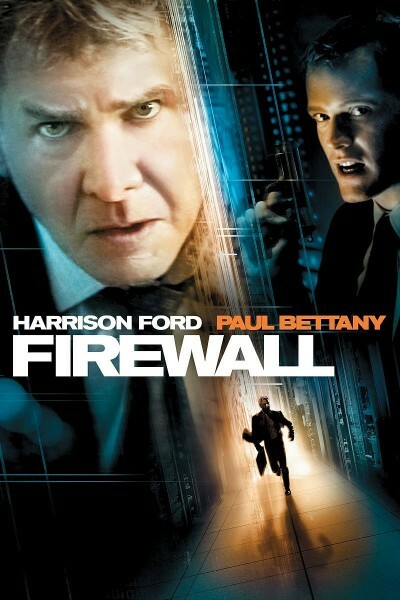 Not only does the plot not involve a firewall, but the word firewall isn’t even mentioned. Cash in on totally irrelevant tech buzzword? Check! This is the largest blemish I’ve seen on Harrison Ford’s otherwise stellar filmography, and it hurts to witness it. You should check out as many Harrison Ford films as you can; just not this one. If you’ve seen The Fugitive, check him out as Allie Fox (my favorite character his career has offered) in The Mosquito Coast. 3/10 because I can’t be too harsh on Deckard, the original Blade Runner.